af off can you post your setting or build good for c mount lens 1024 resolution? interested in trying it. i have lots of c mount lenses. thanks. easy, please read my Reply #2434 and following. Hey, can anybody tell how to use focus dots map , and in what programm it's work ? And is it work better than 3x3 chroma smooth ? Try Mlv App. If you find any dots in recent builds please report about it. Dfort fixed map files for all presets. 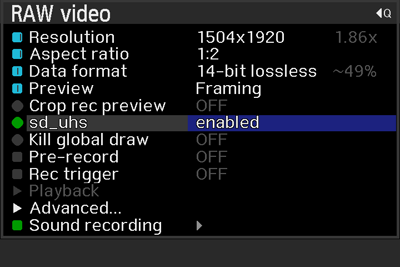 I choosed 880x1468 and could record continuous without any corrupted frames. But, I've noticed that randomly the motion in the image hangs, freezes for short period. all at 23,976 or 24 fps, fresh formatted card before testing, each build on an identical card. Download dforts maps and copy them to same folder as MLVApp executable. MLVApp uses them then. Could the map files be included in Mlv App as default? Good stuff. - Modifying black level for isos higher than iso 100 by checking raw_iso from lens.h. Only affects preview when recording reduced bitdepths. #define ISO_100 72 but seems eosm runs iso_100 as 0x48. Need to check this later. Might help fixing hdr stuff in main builds. 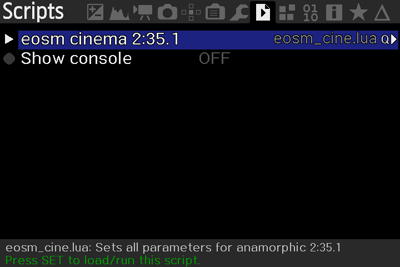 so basically I started the cam with the new build on it, enabled the essential modules, formatted the card from canon menu, after restart I executed the "eosm cinema 2.35:1" script. now, this is interesting - I've forgot to mess with the ratio setting in croprec submenu, so there was still ratio of 2.35:1 set. result was nice, only one corrupt frame out of 3100 and no stuttering or so. then I've noticed I've forgot to change the ratio, so I changed it in croprec to 16:9 and recorded another two minutes. I noticed also after the ratio change, that res was corrected to 1136x2000, which is little less 16:9 then my set res before. viewing in mlv app, in this clip I've had 7 corrupt frames and stuttering in the movements, not that much, but it was there. then I changed the preset to 2.5k and recorded at max res of 2192x1234 another 2 mins. no corrupted frames or anything else, clean picture at 24 fps. so maybe its best not to touch the ratio setting after executing the script. will test further, thanks to Danne and others for this. Today's version installed. Very stable in 4.5k resolution with the cine 2.35 script. More than a thousand frames without errors but when I connect the hdmi monitor it becomes unusable: 1 corrected frame 1 corrupt. Any ideas? Thanks for all! just curious - how come, 4.5k anamorphic AND old cam / old hdmi should work ? isn't it to much to expect? is the case now). for You. maybe even possible to have both, but for what price? and a question - does this setup of Yours work with other versions then Danne's ? Practically no experience with hdmi out connected but seems the setup steals some good overhead causing frame corruption. Regarding different ratios and stability around them. I put in some heavy testing around 2.35:1 ratio to get that working. Very likely room for improvements and my pragmatic approach fine tuning reg 6008, 7150 and 713c might hold a more stable math that I don't see but I can't calculate it. Yet. thanks marcello.& wish You luck, trying the nightly , experimental and dforts, even the old TL versions with, to check out Your pref. setup. sometimes also imagined the need to have another than the build IN screen for convenience or sheer necessity. f.E. indoors, having the cam on tripod 6 feet high, the wall behind, then you think, its impossible to check the picture without a ladder . me too & all of us like Danne's and other Dev's effort and Knowledge to circumvent the crazy-ness of the cartel of the industries. so more resolution what everybody wants and willingly pays for - we get for just a smile. this is great and the question is, - how come, I don't help at all with this stuff, but I wish, that to become true, what I need right now, because this would be awesome. isn' it strange , how difficult (see diffi - cult) it is, to help with something, one self wish to the heart? so what can we do about it, as non dev's. I hope You check out Your setup with the other versions of ML which are at Your fingertips and if You don't mind report here Your findings. @Danne - thanks for clarification in general, much appreciated. @masc - thanks for the new MLV App ! Pretty exciting new stuff on the EOS-M, congratulations Danne! Any chance that the 100D receives an update too? I would love to test, especially now that MLVApp v.1.6 handles this new HDR stuff so well. Not my 100D here but I think it handles hdr well already. Just set mv1080p_mv720p mode to 50fps and enable hdr from the usual place to enable iso switching. Maybe the mv720p 3x3 crop rec setting would be even better here. Thanks a lot, Danne! Can't wait to test! Some bleeding edge stuff. Tested around some on my eosm. Also added for 100D(untested). Please report how it works. Also good idea to put sd hack into raw menu. Why? I'd use this option for still photos, too. In my opinion, sd_uhs and MLV recording are very different things and should not stay in the same file. @Danne: sorry to say, but you really need to make your commits atomic and readable. Otherwise, you'll end up with code nobody else can follow. OK, I can probably reverse engineer it, but that's not the point. I'll have a look @alex. Thanks for links.